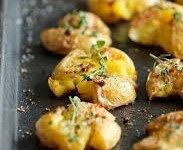 These potatoes are incredibly tender on the inside yet amazingly crisp on the outside - the perfect side dish to any meal!! Dutch Yellow Baby Potatoes - 1.5 lbs. Roasted Garlic Oil - 2 tbsp. Fresh Thyme Leaves - 1 tbsp. 1) Preheat oven to 450F. Line a baking sheet with parchment paper. 2) In a large pot of boiling water, cook potatoes until tender, about 15-20 minutes; drain well. 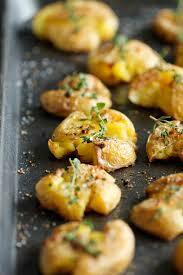 3) Place potatoes onto the prepared baking sheet. Using a potato masher or fork, carefully smash the potatoes until flattened but still in one piece. Top with roasted garlic oil, garlic and thyme. 4) Place into oven and bake for 18-20 minutes, or until golden brown and crispy.